The Ark of the Testimony, the centre of religious worship for the ancient Israelites, occupies a special place in New Bible Code. An elegant ELS encoding within the first two verses, formed by the words ARK and HERE crossing, alerts us to its presence like the 'X' on a treasure map. Here is the 'X'. The final 'e' of 'here' is also the final letter of the 27th word, 27 being the reduced value of 'the Ark'. To what is this sign drawing our attention? A spectacular encoding of the ark, its atonement cover, the cherubim and the altar of incense is found in the first word string in the NIV Bible. The table below summarises it. After I found them I thought that these were the encodings to which the 'X' was pointing. However, they constitute only a few jewels in an entire treasure chest buried in what I call the Garden - the first five verses of the NIV Bible. The Garden is a matrix of interlocking numbers of unfathomable complexity, so laden with encoded information as to justify the description 'holographic'. For example, as displayed here, it witnesses to the creative acts God performed on each of the six days of Creation. On witnessing, a striking feature of the Garden encodings is a phenomenon I have called the double witness. Each concept appears in biblical Hebrew and in modern English, converted by the code's unique two-part decoding procedure into two numbers. These are consistently found close to each other within the text, which is not what we find with random numbers. The two numbers are derived from the first appearance of the concept in the Masoretic text and the equivalent words in the NIV Bible (1984), so there was no cherry picking of data. This consistent pairing of Hebrew and English within the Garden is a double witness to God's creative power. The treasure I found was a much more detailed suite of encodings of the Ark, its every component part and all of its contents - the presence of each item confirmed by the double witness. This is the miracle of miracles, to which I, stumbling, have been led after fifteen years of struggling to unlock the code. The proper name for the ark is first found in the quoted verse, and the two numbers were taken from the Masoretic and its precise translation in the NIV Bible. Note that the definite article (the) is included here, since that is part of the NIV translation. Finding both numbers beginning on the same word is about as unlikely as drawing a named card from a deck, so we have an auspicious start to our treasure hunt. The Ark was made of several parts, all of which described in detail in Exodus 25. The indefinite article 'an' is part of the English translation of Kaporeth and so had to be included. This is a particularly good alignment, as we might expect for the article representing Christ, our atonement cover. The moulding is the crown fashioned around the rim of the atonement cover - and this is a particularly well-fashioned encoding! The number 207 is also found in the small overlapping string from words 47 to 51. Other than that, these are the only instances of the numbers 207 and 500 in the Garden. The separation between the Hebrew and English numbers within the Garden caused me much consternation at first, as I was by now convinced that the sign of an encoding was the closeness of the two numbers within the garden. But God's creativity is boundless and eventually it occured to me that the large space between the numbers might be a deliberate reflection of the positioning of the two cherubim at either end of the atonement cover on the ark. I suspected that if this was a genuine encryption, other numbers would confirm it - and this is in fact the case. 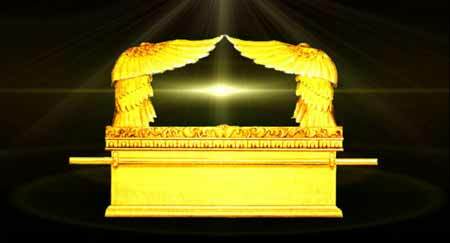 The space between the two cherubim was where the Glory of the Lord manifested. The space between the two numbers in the Garden has an ordinal value of 1255, which is the standard value of the first biblical instance of the word qadash in Leviticus 11.44. The NIV translates qadash as 'consecrate', which is also found in the 'Glory' space, beginning at the same word as its Hebrew equivalent! The Glory residing between the cherubim is also found in two perfectly symmetrical encodings, straight from Psalm 19, which is the first place the phrase 'the Glory of God' appears in the Bible. The two words encoding Kabowd are 'be light', with an ordinal value of 63. This is also the ordinal value of 'the ark'! So the ark also sits at the very centre of this self-reflective matrix and is the cherry on the icing of this magnificent encoding. Finally, there are further encodings here that give an almost literal illustration of the Ark of the Testimony at the centre of the Garden. Incredibly, each of the pairs are all positioned so their centres lie along the very centrepoint of the garden, which is word 41-42. The rings were for the carrying poles needed to transport the ark from place to place. Even these are encoded, as are the poles themselves . . . These are the two poles used to carry the ark, which were put through the rings on either side. The Hebrew gematria of bad (poles) is only 16, which is smaller than that of nearly every English word, therefore it seems the longer description had to be used. So every part of the ark's structure is found in the Garden. However, the ark was not an empty chest. According to various passages in Exodus, Numbers and Deuteronomy, certain objects were associated with it. There are four items associated with the ark, all of which are found along with it in the Garden. As usual, I took the first instance of each concept in the Hebrew Bible, then found its precise translation in the NIV Bible. These two verses are the first to mention the phrase 'Aaron's staff' and the first to connect it to the ark. Both phrases have the same gematria. Note that the staff was from an almond tree. I show here that the Glory and the cherubim are patterned on the vesica piscis and its almond-shaped central vesica, which the gematria of the Hebrew name for Jesus, Yehoshua, reflects. The inspired writings of E. E. Brooks show that the staff, manna and tablets represent the male reproductive organs, the tabernacle the female torso, the Most Holy Place the womb and the ark an ovum. The Day of Atonement ritual represents the fertilisation of the egg by the High Priest. Combining Brooks' work with my own research, I present evidence that the Day of Atonement, and hence the conception of the male child, was symbolised on 9/11. This phrase was the one encoded in both languages, in a powerful double witness to the miracle of God's manna. The tablets are first mentioned in Exodus 16.34 and again in Exodus 31.18, but the spellings and wording are different and there was no encoding within the Garden. However, these verses referred to the old tablets which Moses broke after witnessing the Israelites worshipping a golden calf (Ex. 32.19). God later instructed Moses to make two new tablets, and these were the ones kept by the Israelites in the Ark. So as with the cherubim encodings, apparent discrepancies are seen to be references to important details of the items, signalling creative intelligence, rather than encoding by rote. These are the deft touches of an artist concerned with creatively embodying as much information as possible in his work. In Deuteronomy 26.31 we are told that one more item was kept by the Ark: the Towrah, the very book wherein the Hebrew part of these magnificent encodings is found. "Take this Book of the Law and place it beside the ark of the covenant of the Lord your God. There it will remain as a witness against you." Deut. 26.31. In the NIV we have the double witness of both the Hebrew and the English words, with the definite article. In some versions of the Bible,such as the KJV, the Most Holy Place was often referred to as the Oracle (eg, 1Ki. 6.5). Scripture itself is sometimes referred to as an oracle, because of its power to inspire. The Garden, then, appears to be a kind of oracle, a sanctuary where we can again stand before the Glory and be guided by God. 1. According to Hebrews 9 the altar of incense was found within the Most Holy Place. 2. The presence of the Garden is signalled by encodings of trefoils and similar objects within the first five verses. See here. 3. This part of the code was itself doubly witnessed: by myself and researcher Kathryn LeCorre, who received the revelations that led me to find it. 4. The tree of life described in Revelation is the pattern made by interfering waves. The branches of an acacia tree picture it quite well and this I believe is why the ark, the bringer of life from God, was made from acacia wood. 6. The English phrases 'the Glory of the Lord' and 'the Glory of the Lord God' are both found here too, almost perfectly aligned with the other encodings. Several other numbers relating to Jesus Christ are also found here, but I left them out to keep the page short. 7. I also show evidence that the Ark is to be regarded as a four-dimensional object, pointing us towards a higher dimension of reality. 8. Perhaps the closest analogy is the posited quantum computer, which can instantaneously process huge quanities of information. Information itself is now suspected to be more fundamental than energy or matter and has been succesfully converted into energy.